According to Atty. 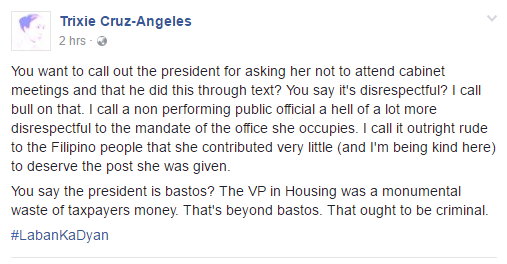 Trixie Cruz-Angeles, Vice President Leni Robredo didn’t deserve her position for not performing her duty well as a secretary of HUDCC. After, Vice President Leni Robredo told not to attend Cabinet meeting, Atty. 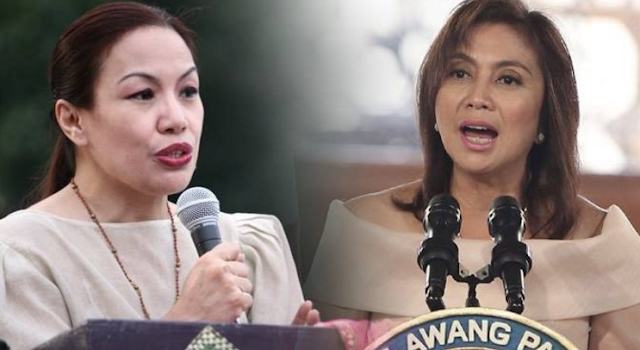 Angeles lambasted Robredo saying it was “disrespectful” because she non performing official. Atty. Angeles also said that it was waste of money for assigning Robredo in the post. You want to call out the president for asking her not to attend cabinet meetings and that he did this through text? You say it's disrespectful? I call bull on that. I call a non performing public official a hell of a lot more disrespectful to the mandate of the office she occupies. I call it outright rude to the Filipino people that she contributed very little (and I'm being kind here) to deserve the post she was given. 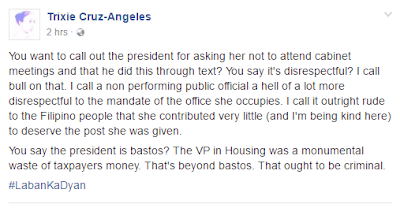 You say the president is bastos? The VP in Housing was a monumental waste of taxpayers money. That's beyond bastos. That ought to be criminal.